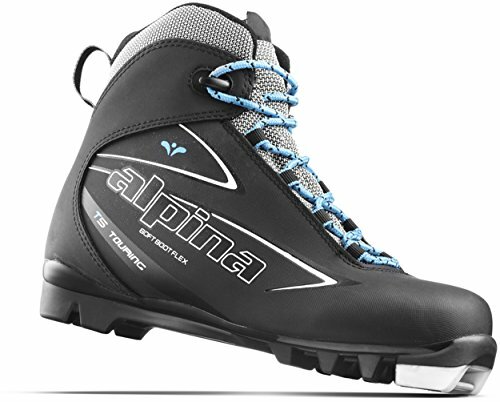 Alpina Sports Women's T5 Eve Touring Cross Country Nordic Ski Boots, Euro 37, Black/White/Blue by Alpina at Notakem Bara. MPN: 55182K-17-37. Hurry! Limited time offer. Offer valid only while supplies last. The T5 Eve Women's Cross-country Touring boot from Alpina offers the beginner and intermediate cross-country skier and comfortable boot for Touring. The T5 Eve Women's Cross-country Touring boot from Alpina offers the beginner and intermediate cross-country skier and comfortable boot for Touring. Predominantly destined for use in established trails, the T5 has an easy-touring soft flex for an comfortable extended stride. Thinsulate brand insulation adds warmth and the PU upper resists moisture. Compatible with NNN bindings and particularly designed to be used with the Rottefella NNN Touring Auto binding. A perfect boot to compliment Alpina Energy, Control 60 or Control 64W cross-country skis. Available in euro sizes 35-42.